Granted, our set of wheels might not be quite as sophisticated as some of the ones you’re likely to see on your screens over the coming few weeks, but they do the job nicely and allow us to see some of the beautiful scenery Poland has to offer. 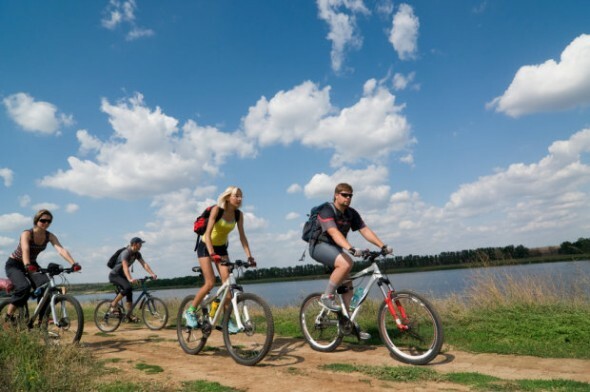 Hitting the road out of any city will provide you with a perfect away day but to fully enjoy the best the country has to offer, then a cycling holiday in the Mazury region is required. With its luscious greenery and stunning blue lakes, this is Poland in all its full glory – a million miles from the hustle and bustle of Warsaw or the ram-packed touristy streets of Krakow. The only problem with taking our holiday in such a fantastic place is that we never want to return once it’s finished. Let’s hope this great weather keeps up so we get another chance to head here again before the summer ends.